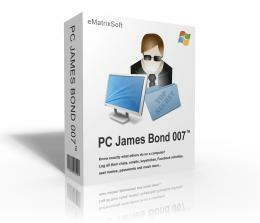 PC James Bond 007 is a secret keylogger Facebook Skype Windows Live Messenger (MSN Messenger) and Yahoo Messenger spying software. It also records web visits emails read online searches shopping records applications excuted clipboard content documents opened etc. It starts with system startup and runs secretly. Computer users wont know its existence. All users on the monitored computer will be logged. You can view logs on the monitored computer or receive reports remotely via emails or ftp like every 60 minutes. It has extremely easy-to-use interface even for computer beginners. PC James Bond 007 is a great tool to protect your kids online monitor employees catch a cheating spouse and track your computer.